Blue Cross and Blue Shield of North Carolina has invested $1 million with the North Carolina Community College System to help fund associate degree programs in emergency medical science at five community colleges across the state. The investment will address health-care needs across North Carolina, including the opioid epidemic, by supporting student academic success, faculty recruitment, retention and professional development; and state-of the-art equipment and technology. Like much of the country, North Carolina has seen dramatic increases in addiction and overdose rates in recent years. This increase emphasizes the importance of adequately trained and sufficiently resourced emergency medical personnel. Conway announced the funding at Rockingham Community College in Wentworth, where he was joined by NCCCS President Peter Hans. “As a North Carolinian, alarmed at the plague that is the opioid epidemic ravaging our country, I’m comforted by the fact that there are peers taking action, trying to help our families, our friends, our neighbors,” Hans said. Blue Cross NC’s investment aims to specifically target combating the opioid epidemic in the state’s most distressed areas, based on statewide data. These areas have some of the highest unintentional opioid deaths in the state. In addition to Rockingham, the community colleges awarded the funding are Brunswick, Lenoir, South Piedmont and Wilkes. 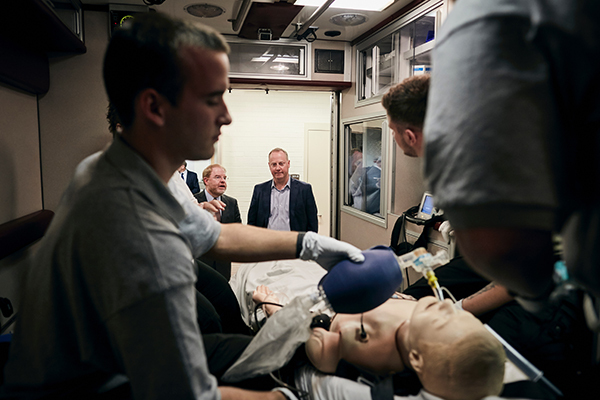 Support advanced coursework for EMS faculty, with a focus on targeting best practices for patient treatment, clinician safety, and understanding of the opioid crisis – both in safety for health-care providers and safety for patients. Replace outdated training equipment and technology to expand opportunities for clinical practice. Expand funding for subject-matter-expert tutors, simulation lab faculty, student scholarships and emergency funds. Health professionals that train in rural and underserved settings are more likely to choose to practice and remain in such settings, according to the National Center for Biotechnology Information. Community colleges provide affordable educational opportunities for persons living in these geographic areas, allowing students to remain close to home while pursuing a degree, and offer rewarding career opportunities for graduates once they complete their education. Annually, the NCCCS provides education and training for the majority of Registered Nurses, Licensed Practical Nurses, and EMS personnel in North Carolina. Over the past eight years, the NCCCS has had 45,412 emergency medical technicians, 6,749 Advanced EMTs and 16,346 paramedics enrolled in EMS programs.